This back shaver has been overhauled. 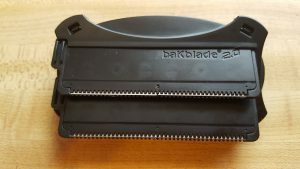 I’ve reviewed the original BaKblade (version 1.0), you can check out my review of the original BaKblade here, What Is BaKblade? As this received my highest ranking to date before this post, in part for ease of use, long handle, and most importantly its effectiveness. So, the new BAKBLADE 2.0 has a lot to live up to. Most of the changes I like, and some of the others I do not like. What Has Changed From 1.0 to 2.0? Well, actually a lot has changed. Almost a complete overhaul. 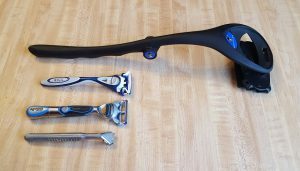 A redesigned of the shaving head attachment, from a single shaving head to the current model having two shaving heads stacked over each other. Collapsible handle for storage or for traveling. GREAT! A more pronounced s-curve to the handle to reach harder to reach areas. A little cleaning brush is provided and attached to the underside. Color change, from blue to matte black. A suction cup hanging device is included. 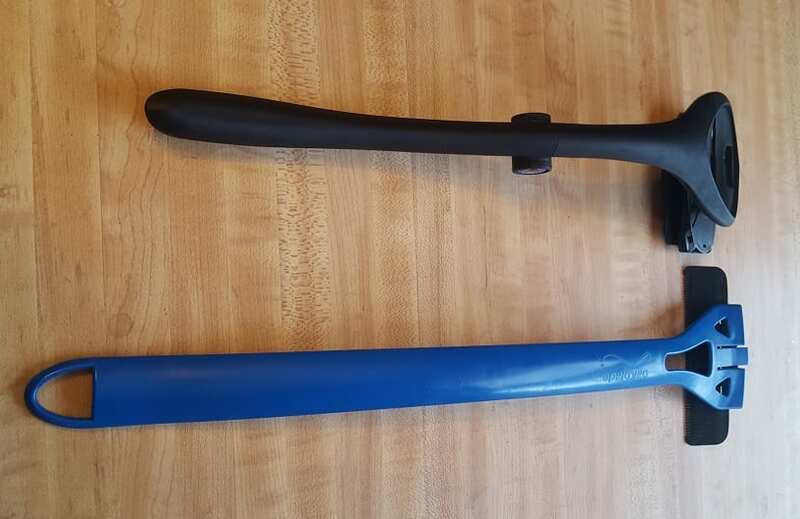 Size comparison: BAKBLADE 2.0 and the original BaKblade. 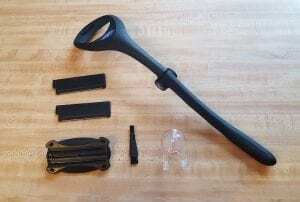 1 – BAKBLADE 2.0 Back Shaver – The attachment head is removable and slides in and out. From top to bottom the BAKBLADE measures 15 3/4″ inches long. The handle has an s-curve to it and contoured slotted grip for secure handling. At its widest, it measures 3 13/16″ inches wide at the detachable head. The detachable head holds two blade cartridges. From my dealings with various other back shavers, which use replacement safety razors blades in their design of there blade cartridges, I see BAKBLADE 2.0 uses only two blades per cartridge, as they use three in the original BaKblade 1.0. But they give in total 4 safety razors blades as there is two blade cartridges. Stacking the blades over the top of the other, kind of like what you see in beard shavers, which have up to 5 blades in this manner. How Does The BAKBLADE 2.0 Perform? It performs great. Providing the shave I’d expect to get from this company from past reviews. I hit my back with this and left my back smooth and in no time at all. 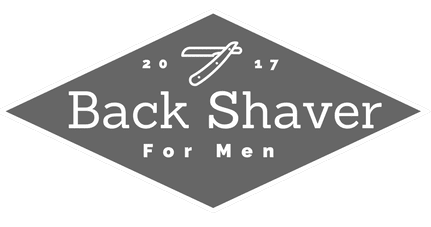 While the narrower razor width does mean more strokes to rid yourself of back hair, it provides two separate blades cartridges to shave more effectively over a given area. Although, I like a wider width I can see their approach and insight to doubling up the blades. The razor just naturally indexes, no matter the angle of shaving. Why is indexing so important? So, you don’t have to really think about the blade angle and make constant adjustments to your arm, shoulder or wrist. It just happens naturally. Just simply pulling this device across your back in smooth short even strokes, works great! I was really impressed with, and always am, with the DryGlide design. As it never cuts my back, no matter how hard I apply pressure or shave or irregularities on my skin (moles, etc). No need to worry about clogging! Doesn’t clog with hair at all. I’m a big fan of BAKBLADES DryGlide technology. Cuts hair effortlessly, without cutting your back. Blade longevity – although I haven’t used it but once, so far it should last for about seven to eight shaves. Good news, it still cuts hair like the original. Can be used to shave both wet and dry. Changing blades is a snap. You can buy a BaKblade 2.0 BaKjacKet, which is a protective cover and back scrubber to clean your hard to reach back. Folding handle for easier storage and traveling. Didn’t cut my back once while shaving my back. Does Not clog with hair! An important aspect, as the hair, simply drops away. Stored on the underbelly of this back shaver is a handy little two-sided cleaning brush to keep your back shaver clean and in working order. Easy to slide the blade cartridges in and out of the head of the shaver. 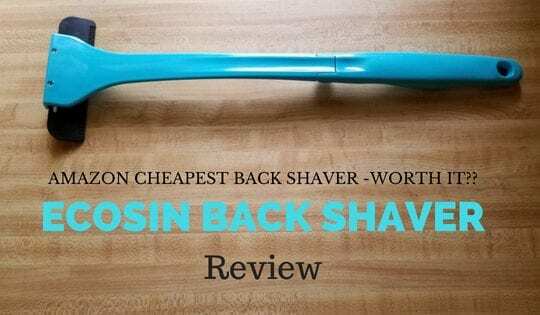 Really works well on the upper back and shoulders, as it easily follows the contours providing constant contact while shaving. The handle is now foldable for compacting for storage or travel. The pivoting system seems very stout and securely stays in place while shaving. Virtually, no side to side wiggle at the pivot point!!! The redesigned handle is more ergonomic than the original too, having an ergonomic S-shape to it. Plus it is more comfortable, having contours that fit your hand nicely and slotted grooves to improve grip. Cartridge blades insert and remove easily, and most importantly stay locked in place while shaving. Detachable head for shaving other areas of your body. This slides smoothly in and out and also stays securely in place while shaving. 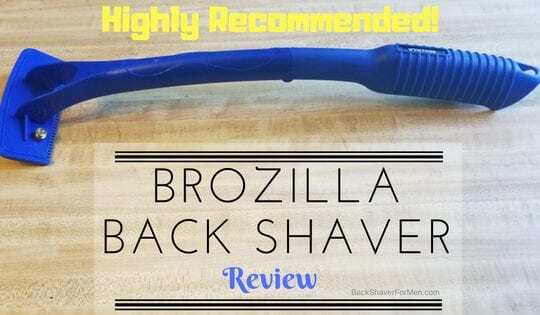 I tried something new with this shaver I pop out one of the cartridges to shave my neck area (with no handle), as it is hard to shave the neck and this did a great job of cleaning up my neck. As well as other areas of your body. This method is a more fine detail approach than to just detaching the head and shaving with both blade cartridges. I can tell a lot of thought and care went into designing this model. Quality materials and design are used and implemented into this shaver. Quality plastic and highly engineered parts that I’ve seen in a back shaver. I really appreciate the extra items included with this, the cleaning brush, and hanging bracket. Very thoughtful and useful. A very sturdy material, cannot see this breaking if dropped. 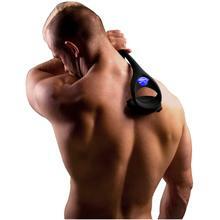 Great back shaver for people with a lot of moles on your back. 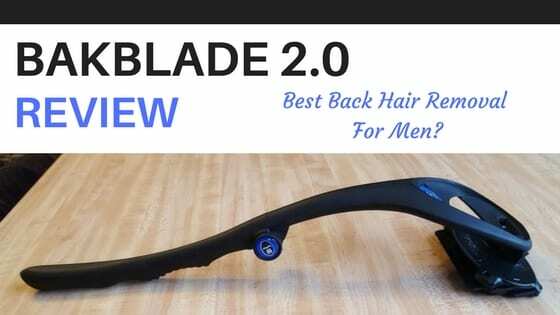 As this BAKBLADE 2 doesn’t cut your skin, just the offensive back hair. Shorter handle 15 3/4″, while the BaKblade 1.0 is 17 3/4″. Quite a downsizing. Important note, I have contacted the owner and I was informed the handle will be longer. Another redesign is underway. I really missed those couple of inches when shaving my back and glad to hear that they will be lengthening the handle. I like a long handle on a back shaver. Reduced blade cartridge width. From the original version which is a solid 5 inches wide to the version, 2.0 is 3 3/8 inches wide. Granted there are two blades cartridges now, instead of one. Just not as good wielding as the original, this might be because of the added weight. As the original is extremely light. In terms of weight, the 2.0 is quite a bit heavier the original. As the original 1.0 was extremely light, the 2.0 is at least twice as heavy. Feels very sturdy and highly unlikely to break if dropped. This shaver can be used both wet and dry. Try shaving in the shower to see if you prefer it better over shaving. There is a good suction cup hanger that you can attach to your shower too. Taking a blade cartridge out of the shaving head and using it to shave your neckline, chest or abs. This works great for detailing these areas, providing a more refined touch without the risk of cutting yourself. I really cleaned up my neckline nicely, after shaving my back. As it is hard to shave your neck with any back shaver. I usually just go for a beard razor for this process but glad I didn’t, as I found an easier more effective method now. 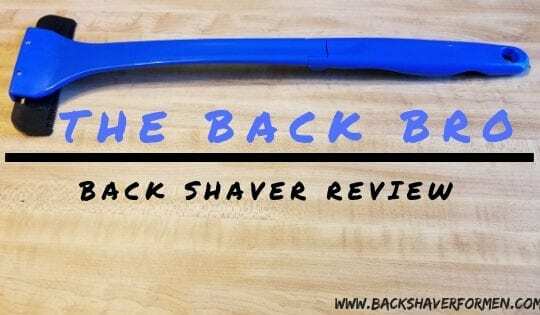 When purchasing this back shaver, I highly recommend you pick up the BaKblade 2.0 Six PaK, as this is the most economical, as you can save more money by buying the BaKblade 2.0 Four PaK. For an extra two bucks, you get two more replacement cartridges. WORTH IT! Clean you BAKBLADE 2.0 before putting it away. BAKBLADE provides a nice little brush to effectively clean the blade cartridges. As they can become dirty after a session of shaving, with skin cells and tiny pieces of hairs. The blade cartridges easily slide out to allow you to effectively clean the bottom side of the cartridge. They also have a back scrubber attachment called BaKblade 2.0 BaKjacKet, worth noting for cleaning your back. I get the best results with short even deliberate strokes. Vary your strokes to find what works best for you. Great products are made by great companies, companies that want happy returning customers. Because if you please your customers, people will continue to buy your product. BAKBLADE is one such company. Innovating, adding useful features, providing options, and most importantly pleasing the customer, this is what makes BAKBLADE the leader in the back shaving world. The performance is what I come to expect from BAKBLADE. Each swipe of the blade leaves clear smooth hairless patches of skin. 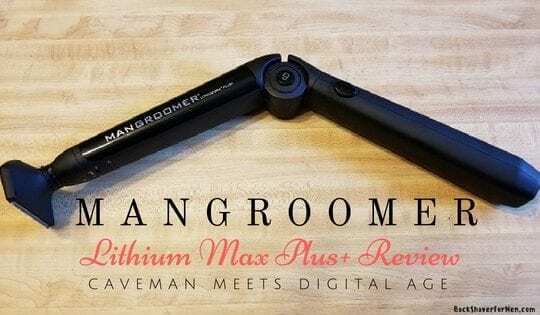 Take confidence in knowing this is one of the best back shavers on the market. Doesn’t clog at all with hair. Absolutely zero nicks or cuts using this! Reach needs to be improved. This is in the works already. Folds easily for storage or travel. Buy The BakBlade 2.0 Now! How often should I replace the blades if I use the bakblade once a week? I find I get at least 3 to 6 back shaving sessions with baKblade blades before having to replace. This will vary from person to person as everybody is different. Shaving every week is a good idea as you will have less hair to shave off, as opposed to letting it go for several weeks then shaving. When the blade goes dull you will notice you have to go over the area multiple times to remove the back hair. Either you have a build up of hair or the blade needs to be changed. Does it work well for shaving your privates? Don’t want to cut or lob off any important equipment. I haven’t tried it…nor would I suggest it. As it isn’t designed to do that. One product that works well for your scrot is this https://amzn.to/2MpBfex. It works really well despite its width.